Featured image, of Jonas Mekas—the legendary independent filmmaker, poet, artist and inspiration to avant-garde cinephiles the world over—was made in April, 1946, while Mekas was living in a German displaced persons camp en route between his native Lithuania, which he fled in 1944, and his future home of New York City, where he died on January 23, 2019, at the age of 96. 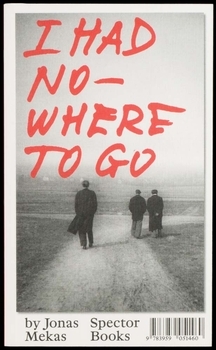 It is reproduced from Spector Books' essential memoir, I Had Nowhere to Go, in which Mekas details his lonely, yet heroic and searching early years through the mid-1950s. In a 1953 entry, Mekas writes, "They say, do not lose the road for the small path… It depends where the road is leading to. It depends where one wants to go. There are places which you can reach only through tiny paths. Only the dictators, armies, generals, and people without imagination prefer wide, 'strong' roads. Little paths take you to the gentle meadows, brooks, flowers, cool shadows. I wouldn't like to miss any interesting side paths, patches of greenery. Because, at the end, at the end of the Big Road, there may be nothing but a burned out city… pestilence…"